It's here! 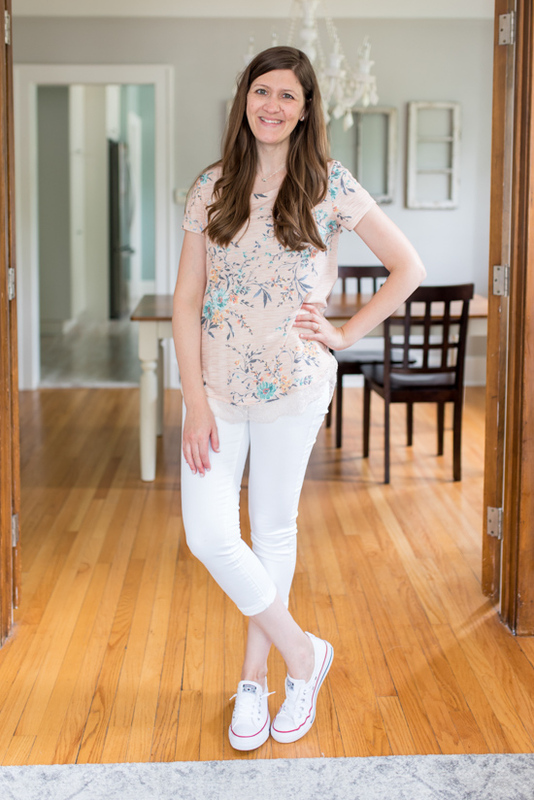 Another summer Stitch Fix review! After last month's total bust where I sent everything back from my fix, I was hoping that this month's fix would be filled with at least a few goodies that I loved. 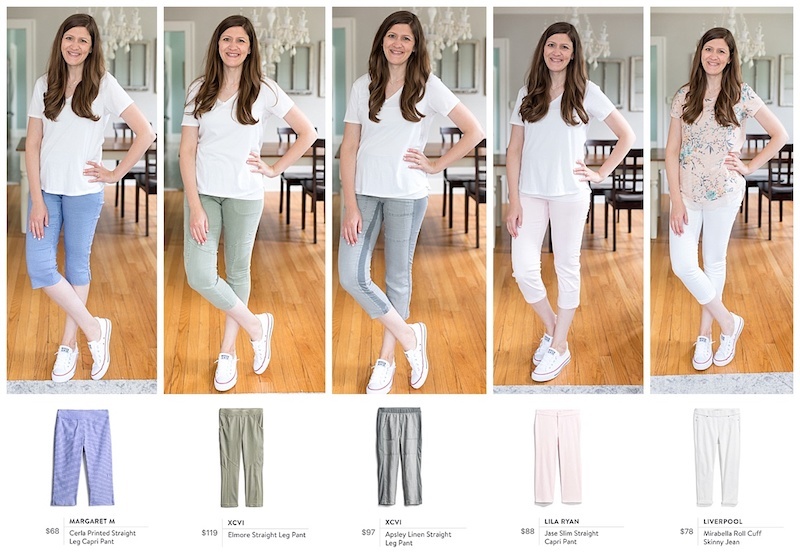 I tried to keep things super-simple for my stylist and requested an all-pant fix filled with great casual pant options that I could wear around the house or out running errands this summer. My stylist, Jenn has only been styling me for a few months and I think she's still learning my style preferences. And I'll be the first to admit that I am a very picky customer. I work hard for my money, have a house that I'm trying to pay off as quickly as possible and I've learned to only keep clothes that I really and truly love. And thanks to my Stitch Fix style pass, I have the ability to return any unwanted items from my fix without any guilt. But now I'm getting ahead of myself. This post contains affiliate links, including my Stitch Fix referral link. I earn a small commission each time someone makes a purchase through one of my links, which helps to support the blog. 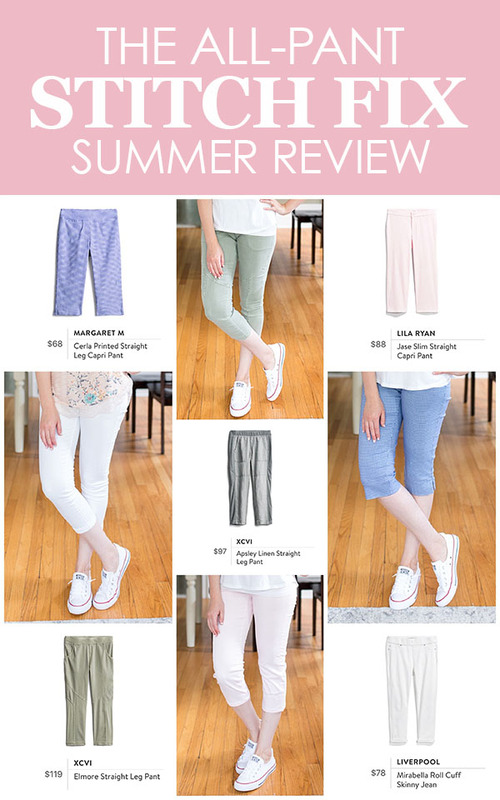 I truly hope you enjoy reading this month's Stitch Fix review. Just in case you don't know what Stitch Fix is or how it works, I'll break it down really quickly for you. Stitch Fix is an online personal styling service that matches you with your own personal stylist. 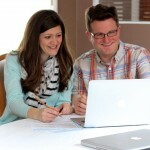 You get started by creating a FREE online style profile. Once you schedule your first fix, you'll be matched with a personal stylist who will hand-pick five items for you based on the information you share in your style profile. Want a collection of items that you can take on your upcoming vacation? Perfect! Need great pants but have to stay within a certain budget? No problem! Just need a few simple items for a wardrobe refresh? That's never an issue. Want a complete outfit from head to toe (including shoes and a handbag?) Stitch Fix is perfect for that! There really is no right or wrong way to schedule a fix and the stylists are super-accommodating to your needs. I have scheduled a vacation fix, an all-dress fix, maternity fixes, an athleisure fix – there are so many great reasons to schedule a Stitch Fix shipment. You'll be charged a $20 styling fee to get started, which covers your shipping and return costs. Best of all, if you choose to keep anything from your fix, the $20 fee is automatically deducted from the cost of your clothes. And if you choose to keep everything from your fix, you get to save 25% on EVERYTHING with the Stitch Fix buy-all discount. Stitch Fix offers petite, maternity and plus size styling – they even style for men! My husband Rob has been a faithful client of Stitch Fix Men and always looks forward to his fix arriving in the mail. 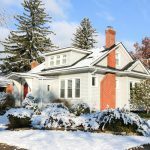 You can check out one of his reviews in this blog post. Who says grownups get to have all the fun? Probably the same people who think that mom should run around from store to store, shopping for new back-to-school clothes for the minis. 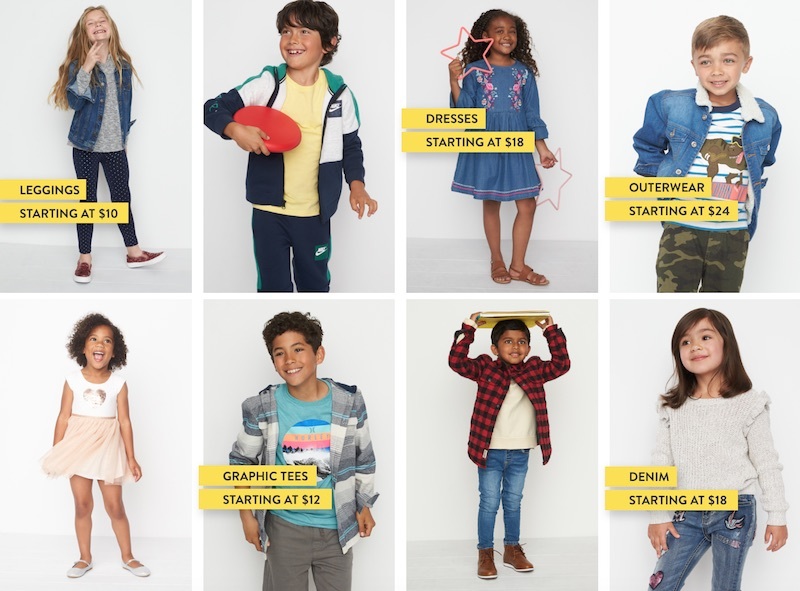 Fortunately, Stitch Fix now takes a lot of work out of the back-to-school bustle by offering styling for kids! Each kids' fix comes with 8 to 12 pieces that are a perfect fit to your little one's personality. Not only that, but they keep the price points low since kids grow out of their clothes quickly. 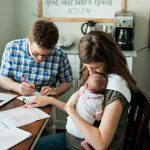 Stitch Fix Kids offers clothes for sizes 2T-14, which means that Dessa is a little too small to enjoy the service, but prices like these can definitely fit into the Gavin family budget. 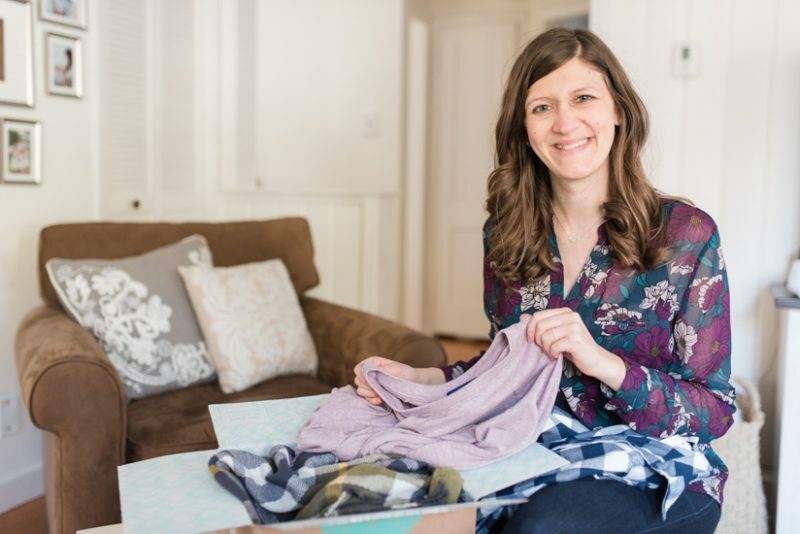 Stitch Fix also makes it super-simple for mom (or dad!) to manage fixes for kids. 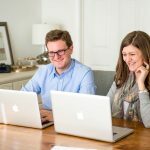 You can turn your regular account into a family account – which will contain your styling information and up to four kids accounts. At this time, only one adult can be linked to a family account. 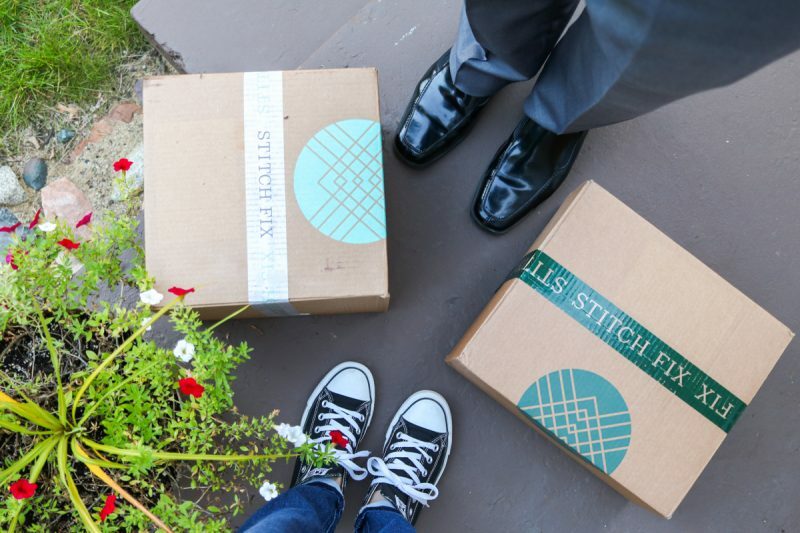 Sign up HERE to give Stitch Fix kids a try. If you sign your children up to receive fixes, you will have to let me know what you think! 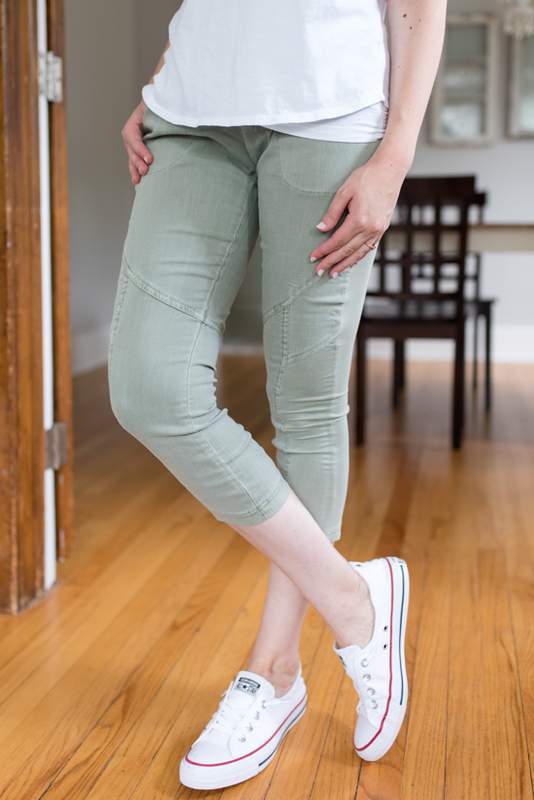 When I opened the Stitch Fix app on my iPhone and saw the Cerla Printed Straight Leg Capri Pant from Margaret M ($68), I thought “No way – those pants are never going to ever be my style. They're too short, they're too baggy, they're too bright and they have a pattern.” Then I opened up my fix and my initial impressions were confirmed with “Nope. Nope. Nope!” Then I begrudgingly tried them on and started to think that I may have misjudged these pants. 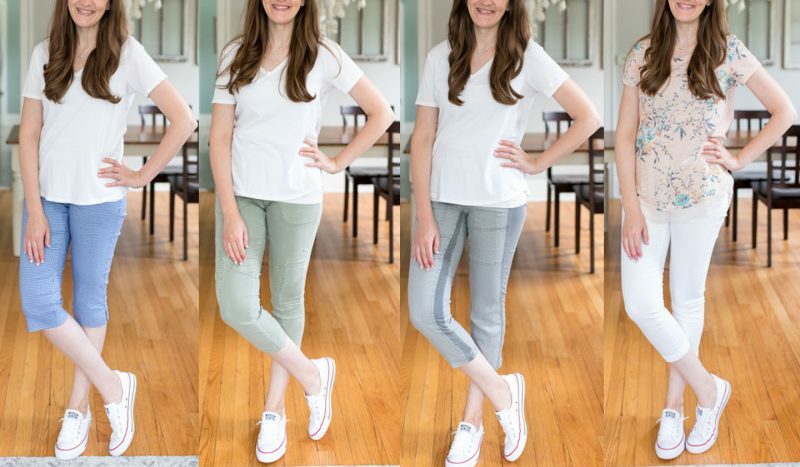 If you're a long-time Stitch Fix customer, you probably know all about the Emer pant. Based on all the discussions I've seen, people either love or hate their Emer pants. I pretty much love mine. They fit great, have a comfortable waistband, a lot of give, and a clean, tailored look. I own a black pair and they are my go-to pants during the school year with a pair of Matte Black Tieks and a blouse. It's always a great polished look. 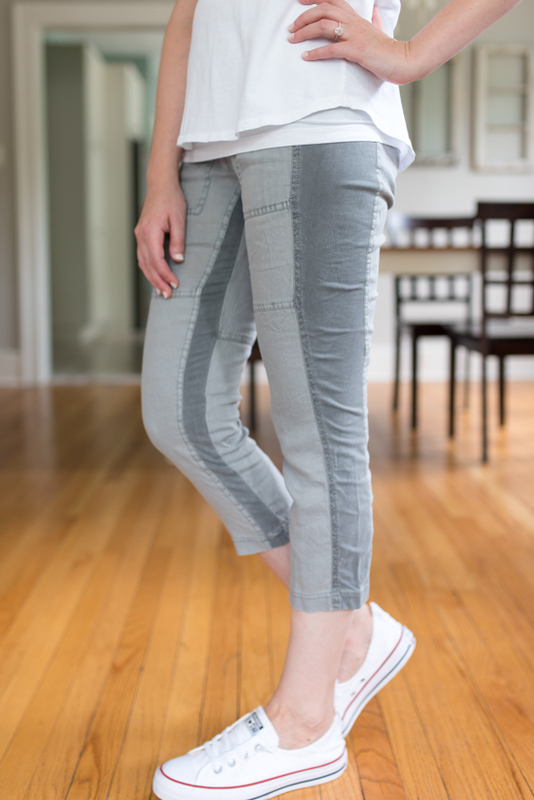 Just like the Emer pant, the Cerla Printed Straight Leg Capri Pant is also from Margaret M and have the same great fit. In fact, these pants are basically the cropped version of the Emer pants. Same great fit. Same great stretch. I couldn't believe how much I liked these pants after I tried them on. They're a great, teacher-friendly compromise between professional and comfortable – especially during those first hot weeks of a new school year. Contrary to my initial impression, these pants were not baggy at all. 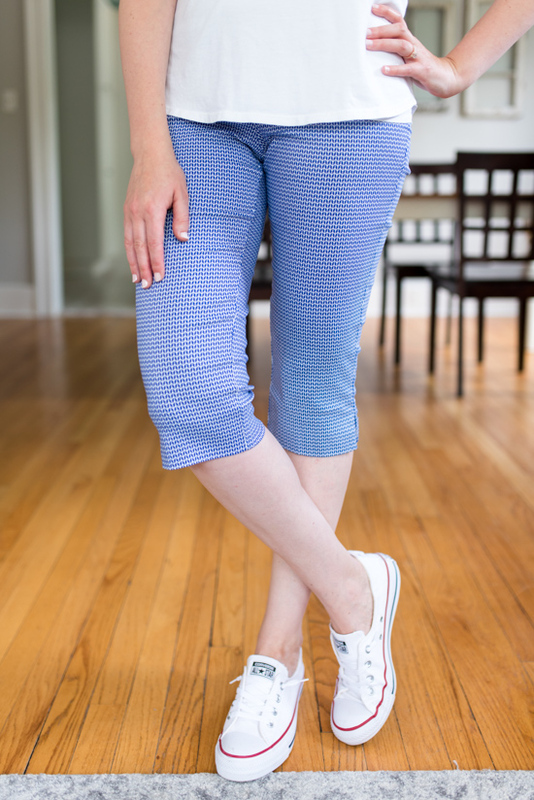 They were a great fit and I couldn't believe that I was actually tempted to keep this pair of Cerla Printed Straight Leg Capri Pants that I was so certain I would absolutely hate. The only catch was the color. They were a touch too bright for my taste and I really didn't care for the print. I'm not one for printed pants to begin with, and if I'm ever going to cave, it would be for a bold print, rather than a small scale print. But if a solid navy or olive pair happened to come my way in a future fix, who knows what would happen! If these pants are your style, I would absolutely recommend them. Next up was an olive pair of Elmore Straight Leg Pant from SCVI ($119). Of all the pants in my fix, these were the most promising when I previewed my shipment in the Stitch Fix app. I LOVE my old pair of olive capri pants and I desperately wish that I could still fit into them. Olive is such a perfect neutral color. These also looked baggy in the app and I wasn't a fan of their straight leg style at all, but I was ever-so-slightly optimistic. Then I opened my fix and started to fall in love. They were so incredibly soft, I couldn't wait to try them on. They also had an elastic waistband, which I was certain would make Elmore Straight Leg Pant perfect for chasing Dessa around the house, decorating classrooms at school, even travel. I don't have any upcoming travel plans, but these instantly struck me as the perfect pair of pants to wear for travel. I was so excited to try on the Elmore Straight Leg Pant. They were a perfect fit and every bit as comfortable as I had anticipated. The only thing not to love was the price. I somehow overlooked that detail when I previewed my fix. We are trying our hardest to save for new furniture and accessories for the house and I simply couldn't justify spending so much money on a pair of pants. Sadly, these pants were going right back to Stitch Fix. As disappointed as I was to return the olive pants, I was a tiny bit optimistic about the gray Apsley Linen Straight Leg Pant from XCVI ($97) that were also included in my fix. Yes, they were still more money than I ought to spend on pants, but since they were a tiny bit less expensive and the same brand as the the olive pair. They also felt incredibly soft and had interesting contrasting panels on the legs. 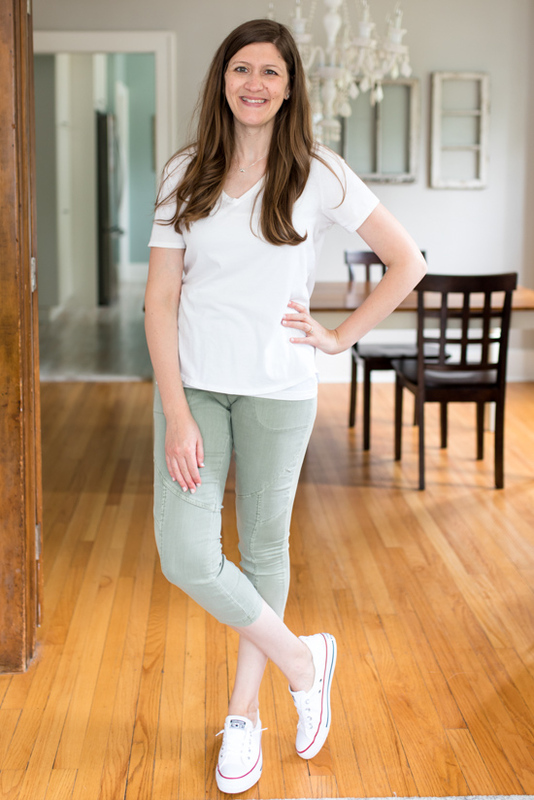 I tried on the Apsley Linen Straight Leg Pant and was actually relieved to discover that I didn't love them as much. They were pretty good – just not my absolute favorite and I thought the panels on the sides had a bit too much contrast – which made them feel a little edgy. 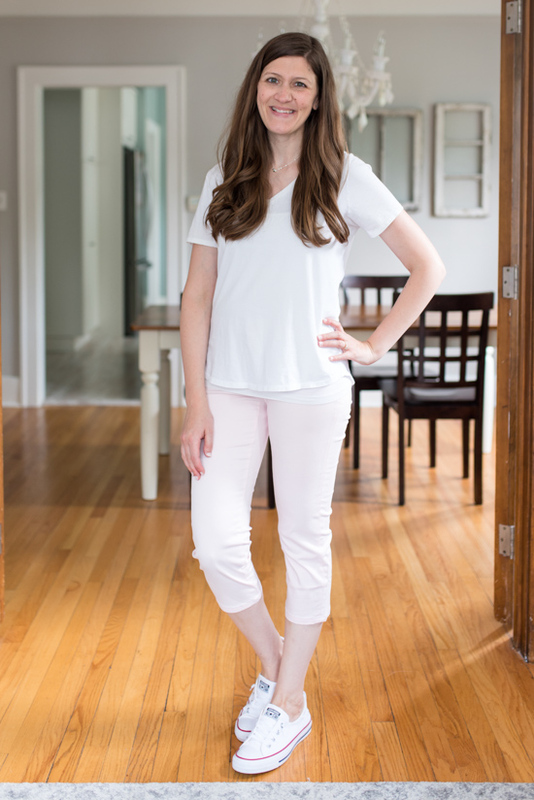 My personal style is anything but edgy so I was perfectly happy to also return the Apsley Linen Straight Leg Pant – which was also beyond my budget. At this point, all three of the pants I tried on were slated to return so I was feeling hopeful when I reached for the Jase Slim Straight Capri Pant from Lila Ryan ($88). I adored the light pink color and was feeling optimistic. 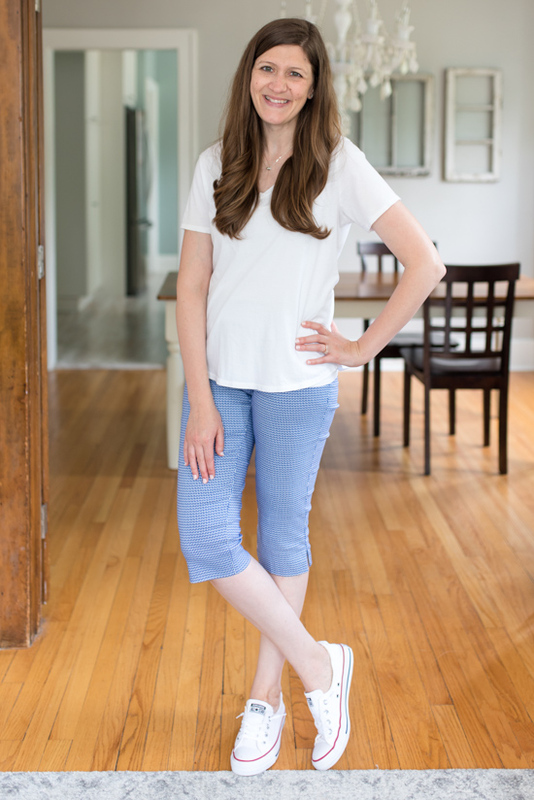 These pants were really great, comfortable, and a perfect fit – plus the fabric was really soft. I was so tempted to keep them but the color was just a little too light. Lately, I've been noticing all sorts of stains on my clothes that are just what happens when I hang around with my little messy eater. If the Jase Slim Straight Capri Pants were just a little darker (perhaps more of a dusty rose color than pale pink) I would have kept them. But I would feel terrible if I dropped $88 on a new pair of pants that were ruined in the first week. These were sadly also being sent back. Four pants down, one to go and I wasn't feeling too great about my fix but I pretty much knew I would love the Mirabella Roll Cuff Skinny Jean from Liverpool ($78). I've received several pair of Liverpool pants from Stitch Fix over the years and they're consistently a great fit. I especially love my denim pull-on pants that I lived in during my first trimester. The Mirabella Roll Cuff Skinny Jean appeared to be the cropped version of those beloved jeans, but there was just one problem: they were white. This was especially disappointing since I had just returned a gorgeous pair of white pants that were in my last fix and clearly stated that my reason for returning them was the color. Even though I was pretty sure the Mirabella Roll Cuff Skinny Jean would be returned, I happily tried them on. The white cropped jeans were a great fit. They had a little give, but no so much that I was worried about them sagging with wear. These were an excellent pair of pants, but if I was going to purchase a new pair of white pants, it would have been the pair I returned last month. They had a step hem (which I loved) and were very sophisticated. 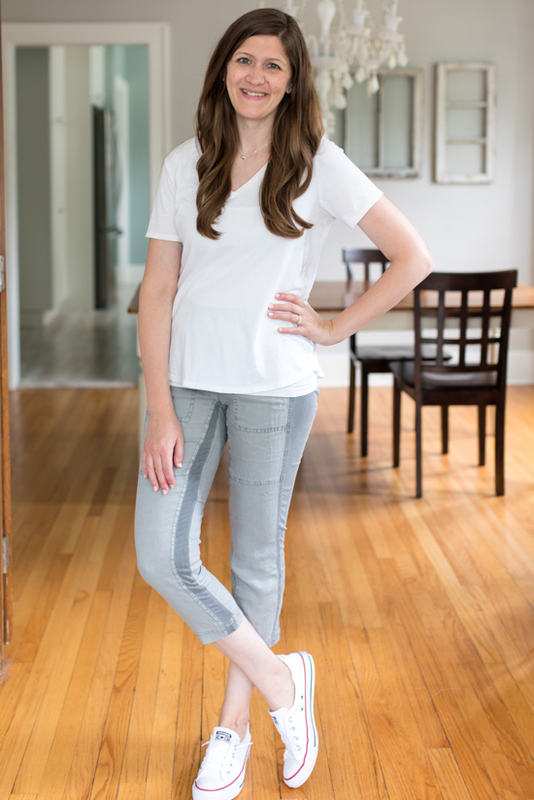 If you are in the market for a pair of white pants, these are a good option, but the Nadine Released Step Hem Skinny Jeans pair is even better! Just in case you're curious about these pants and want to check them out for yourself, I'm pretty sure I found the exact same pair online. Check them out here. If you've been keeping track, you've probably already figured out that I chose to return everything from my fix this month. Here's a quick recap of what arrived in my summer Stitch Fix box. Many of these items were so close to being what I needed. They just weren't quite perfect for my lifestyle or budget. Just because my fix wasn't a home run, doesn't mean I'm likely to give up on Stitch Fix any time soon. In fact, I'm still a dedicated customer and I'm already looking forward to seeing what comes my way next month. I want to share a little of the fun with you too, so I'm giving away a $50 Stitch Fix gift card. Use the rafflecopter for your chance to win! Last month's fix didn't quite fit my style and this month's fix was a much better fit for my personal style – it just included a few impractical items for my lifestyle and budget. My stylist note for my upcoming fix already sets a price limit. How do you think my September fix will go? 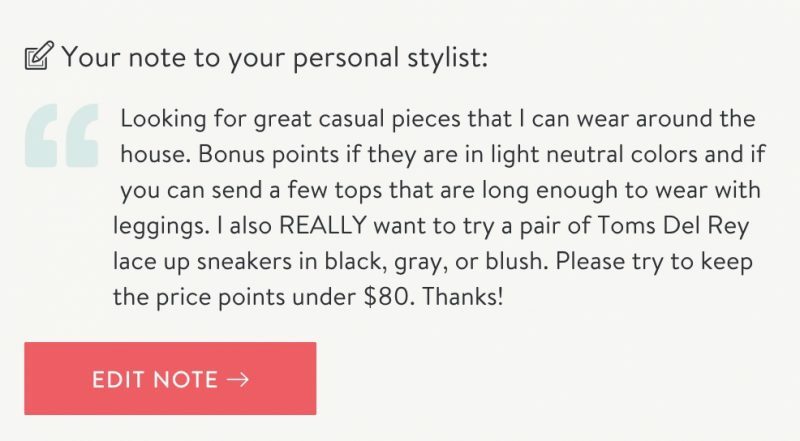 Will it be a hit or do you think my Stitch Fix stylist still has a lot to learn about my very picky preferences? I would love to hear your thoughts and predictions! I bet the next fix will be amazing. Last time I sent everything back, the next fix blew my mind and I kept a lot of things because they just looked too darn good on me to not keep them. By the way, I think all those pants look amazing on you! Love your posts. I feel the same way. My fixes the last few months have been disappointing. I’m sorry Maria, I know how you feel. I hope the next fix is better. I think you will at least get one item (keeping my fingers crossed for those Toms Del Rey for you) in your next stitch! They looked good on you, but much to casual for anything but around the house. I can see why you sent them back. I hope you get the Toms in your next fix, I’ve seen them on pinterest and they look comfortable! I hope so too! I’m so curious about them! I think your next fix will be better. I’ve very rarely had 3 in a row that were busts! Oh goodness, I really, really hope I don’t have three busts in a row! For stains, you might want to try a tiny bit of blue Dawn on the spot. I teach kindergarten and it gets the spots out of my clothes where little hands have hugged or touched. Also, really helps keep my child’s school uniform clean. I think it’ll be better. You always seem to make it look good! I hope your next fix is amazing! I hope the next fix is much better for you. The stylist should have a better understanding of your taste now. I bet your next fix will be amazing! I would not have kept the Emer pants either. 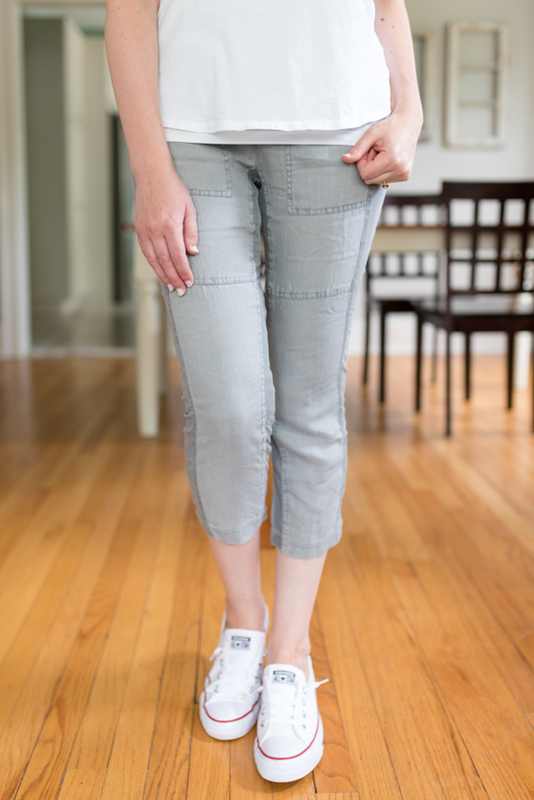 The length is weird, not short enough to be shorts and not long enough to really be capris. I think you made a good decision! 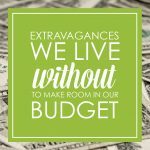 I loved the olive pants but I agree – that is pricey! I think your next fix will be great – your stylist will have started to understand what you want by then! I would not have kept the pants! Super cute but not as cute as other things you have posted from stitch fix before. I agree! I’ve definitely received much cuter pieces in the past! I just recieved my 33rd Fix. As I am a teacher also I rarely keep all 5 pieces, but it’s so fun to open the Stitch Fix box and discover what has been picked out just for me. I find that my stylist sends some items that I would never have tried on and I discover a new style. Everything looks good on you, but I wouldn’t have kept any of the pants from your last Fix. Good luck on the next one! I completely agree about how fun it is to try everything on! It’s always a treat, even when it’s something that doesn’t feel like my taste at all. Although I like the white crops, I probably would have returned everything too. Thinking you will get a couple great pieces you love in the next shipment! I definitely would have returned everything. They are all so similar! I am sure you will get a great fix next time!! I think I would have returned them all as well a litttle pricey for what they were!! That’s my personal opinion!! Thank you for amazing giveaway!! It’s always fun to get a Stitch Fix box, even if the items don’t work out. I agree with you that the pants this time were too pricey for casual wear, especially since you know they could easily get stained from caring for Dessa. I think the several of these pants look great on you, but I agree about the price point. I got my summer Fix this week and I received a $78 t shirt and a $200 dress. Not in my budget. I hope you get those Toms you want! I’ve only done SF a few times and love the experience but not always the prices. As a SAHM whose household is also trying to spend wisely (renovating our basement by ourselves right now then need to furnish! ), I would also not have been able to keep any of those pants in this box. The olive ones seems to have stolen your comfort and style heart but not at over $100, no way. Your note to the stylist is pretty descriptive, I would add that while you love neutrals, no super light colors and the material needs to be washable as well. Good luck, hopefully the next SF box will hit it out of the park style and budget wise! Those are really great suggestions. I thought I was specific enough, but there were definitely a few areas that left room for interpretation! Hopefully this next one will be better! I agree about the color of the Carla print – a little bright and I think it would be hard to find multiple outfit options with it. So sad you had to send back the Elmore straight leg pants, but more power to you for sticking to your budget and goals! That’s great! That was my concern about those blue pants too – it was too “specific” of a shade of blue to be versatile. And the Elmore pants were SOOO hard to send back! I think that next month will be a winner! Your next Fix note seems very simple and to-the-point, and I think specifying a price point should help! I got my first fix last month and doing LOTS of research, including reading many of your posts. I kept 2 out of 5 and am looking forward to my next fix. I’m so glad to hear that your first fix was a good one! Hopefully the second one will be even better! I love your detailed comments on your boxes. It is very helpful. I hope your fix was great! I hope you get a winner next time! Fall is one of my favorite times of the year mainly because of the clothes…I love to layer and Fall is the best time for it! I dislike the arrival of cool weather so much, but I agree that fall cozy clothes are a great silver lining! Should be interesting to see what comes my way! Love the olive green ones but they were spend! Didn’t care for the blue ones! Hope you start getting better fixes. I always enjoy seeing your reviews! Oh my goodness, soooo spendy! I know the blue ones were a hard sell (a lot of people apparently really hate them). I think the teacher in me just loves the school-friendly length. You are smart not to keep things you don’t love — that’s the road to a closet full of things you aren’t excited about pulling out! I think your stylist did a decent job finding light neutrals for you (the white jeans were obviously a miss, due to your comments after your last fix), but I agree that the price points were high. Hope your next one is awesome. I’ve learned the hard way that I always avoid wearing the clothes that I didn’t absolutely love. Hopefully the next fix will be amazing! I bet the next one will be great! I am finding that there are very few machine washable items sent to me in fixes even though I clearly ask for that. Do you have the same problem? Who has time to chase a little one, teach full-time, and hand wash or dry-clean?? Good luck on your next fix – hope it’s what you’re looking for! I definitely have that struggle. We wash all of our clothes on the delicate cycle so I’ve just been putting my “hand wash only” clothes into garment bags and throwing them in the wash, then hang drying them. I don’t do this every day, but so far all of my clothes are holding up well! Maybe that trick will work for you too. Hi there, I’m not sure what’s going on with stitch fix. I had a stylist that I LOVED for years and then the last 4-5 fixes have all been new and different stylists. So I’ve had to explain 4-5 times my likes and dislikes and why. Fingers crossed that is’s a good one!!! Oh no! It’s so hard to part with such a great stylist. I have a feeling your stylist may have left the company and they are bouncing you around to different stylists until you get a great match. Hopefully that happens soon! Hopefully there will be some pieces you like in your next fix. I’ve been on the fence about trying Stitch Fix. You are so detailed in your analysis of the pants! I wonder if your stylist doesn’t realize you are blogging about your fixes…! Also, those olive green ones are just too cute on you! You know, that’s a really good point. I know that the stylist I had for over two years read my reviews because she always mentioned them. This one may not know that I blog about them! I also haven’t had much luck with Stitch Fix lately :-( I did two fixes back-to-back in the spring, and ended up keeping only one item because I requested a specific top that I knew I would love that my stylist thankfully found. The pants from your fix all looked great on you, but I understand why you sent them all back at those prices (yikes!). I’m not sure how this next fix will go… I felt like you were pretty specific this time around yet here we are! I think it will be helpful that you included the price specifically in the note, so that part will probably work out fine, but I’m betting you get something really bold (perhaps bright florals or a really geometric design). I bet you are right and something bold will come my way. It’s funny because I think I’m being specific enough, but there is always a loophole. Someone else pointed out that I said “light neutrals” and that’s probably why I ended up with white and pale pink pants. I’m trying my best with communication, but I can only do so much short of sending a novel her way. Keep trying! Go back through your style profile. It’ll be great! Thank you! I find myself often referring back to my style profile and revising to sort of “catch my stylist up” on my tastes and preferences. I love the color of the Jase Capri pants! I’m getting my first fix in 6 months and I’m a little nervous. I’m hoping I get at least a few keepers. Thanks for your reviews!! I hope you get a LOT of keepers! I love the Elmore, Jase, and Mirabella! The others weren’t my style type. All of the pants looked great on you. I’m looking forward to my August box arriving! Good luck on your next fix!! I think I’ve only seen one or two things that I thought didn’t quite fit you well. I thought these were all very close in style, but they all seemed to fit well and look good. But I’ve decided if I don’t absolutely love it, I’m not keeping it. I’ve been using the style pass, and have now sent back three full boxes that I didn’t want anything. I honestly hope your next fix is perfect! I think your next fix will be half and half. You will only like some of it! I think your next fix will be better. You’ve told them what your price point is, so they should stick to it. A teacher’s budget can’t afford $119 pants. By the way, I love the blouse you are wearing with the white Liverpool jeans. Can you please tell me the maker and where you purchased it? I’m sure the next will be great. There’s always a learning curve. I haven’t been having much luck lately…I had a great stylist for TWO FIXES and then she wasn’t mine anymore…..then I had a woman who just apparently didn’t read anything I asked for–and now I have a new stylist. Not entirely sure how I feel about her yet…. Wow two bummer fixes in a row! That stinks! You were long overdue though, I’ve had several of those and I’m only on fix 40-something. I’ve found that it tends to go in cycles. Also I hate to say but when that happens several times in a row, especially with a new stylist, sometimes it really does help to request a different stylist. Sometimes a stylist just doesn’t “get” your personal style, hard as they may try. My theory is that the ones that do probably have similar tastes. Anyway I felt awkward the time I asked but then got a stylist who really nailed my style so it was worth it. Also great idea to give them a price point! I’ve marked “too high” on the price section of my reviews before but never thought to set a actual dollar limit in my note. Great tip! Also I think the style pass really helps. I used to keep a lot of stuff I wasn’t crazy about just to keep from losing my $20. Now I can request a fix guilt free and as a result only keep items I truly love! Hope you have a much better fix next time! I feel like with two 0/5 fixes a good one has to be on the horizon! If the prices were too high for you, maybe you should update your profile for a lower budget. I received some quality pieces under $50 in my last fix. I feel like your stylist is getting really close to understanding what you like so I’m optimistic that your next fix will definitely be a winner! Also, I’m just getting back into using Stitch fix and I didn’t know you could request an all pants fix or top fix, etc. This is so good to know! Unfortunatley I don’t belong and would love to try in the future. Patiently awaiting my first fix! I’ve heard all great things about their pants! I think that your next box has to have at least one thing you will like in it!